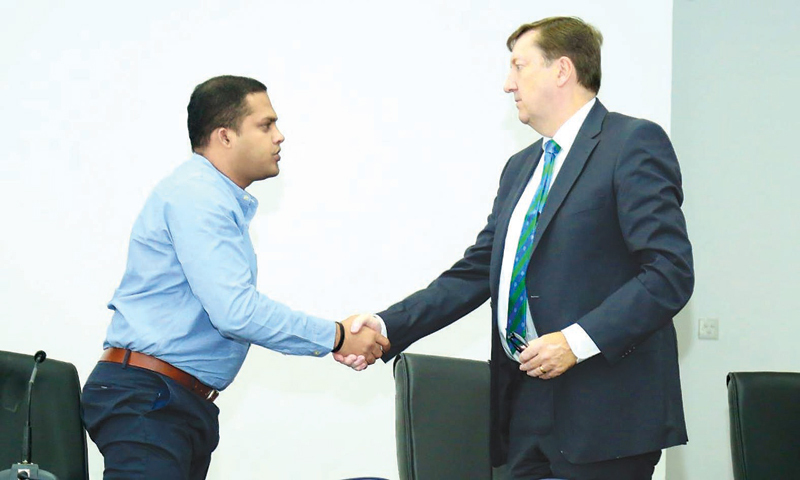 Ministry of Telecommunication, Foreign Employment and Sports Harin Fernando welcomed ICC anti-corruption Unit's coordinator of investigations, Steve Richardson. Sri Lanka Cricket’s (SLC) much anticipated elections will be held only after technical errors in the gazette notification which empowers the Sports Minister to appoint a three-member Advisory Board to hear polls-related appeals have been rectified stated W.A. Chulananda Perera the newly appointed Competent Authority of SLC at a media conference held at the Duncan White auditorium yesterday. “An election of Sri Lanka Cricket was scheduled to be held on the 7th of February 2019. During this course it was depicted that there was a technical error in the translation from Sinhala to English. We have sought advice from the Attorney General regarding the above mentioned issue. According to the Attorney General, the cricket elections could be held only after the technical errors have been rectified,” said Perera. “In due course I have informed the ICC and the Sri Lanka Cricket Election Committee on the above matter. Once the above mentioned situation has been corrected we will make the necessary arrangements for Sri Lanka Cricket elections to be held lawfully,” he said. The ICC has given SLC February 9 as the deadline to hold the elections after it was postponed from May 31. Sports Minister Harin Fernando stated that the ICC anti-corruption Unit's coordinator of investigations, Steve Richardson was in Sri Lanka for two weeks and anyone with information related to cricket corruption can submit their complaints to his temporary office during the period. “During the two weeks, anyone who knows of any frauds or sleights relating to Sri Lanka cricket can submit their complaints. My responsibility is keeping their identity safe and all the evidence confidential. I will safeguard them all,” the Minister said. “Cricket has become a professional sport, so a lot of money is exchanged. As explained by the ICC officers to me, cricket has gone beyond betting, it has been connected to the underworld, this is a serious allegation. As cricketers we have to work together to change this situation, some senior cricketers and officers are trying to change the situation. This is not about cricket board, or interim committees. As cricketers we need to talk about this as a team, not as a single person. If we talk as a single person, it gives a wrong opinion. So come as a team and speak out,” the Minister said. Sri Lanka cricket said that it will publish in a few days through the media the dates anyone with information can submit their complaints. Sri Lanka cricketers also attend the press conference.